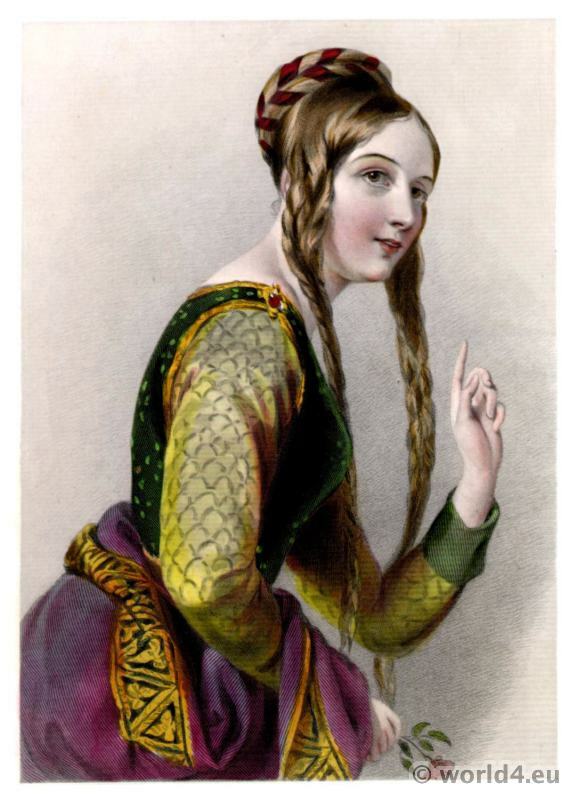 Home » Fashion history of medieval England. 12th, 13th c.
HENRY II, 1154-1189; RICHARD I., 1189-1199; AND JOHN, 1199-1216. The Wimple and Peplum Head-dress, 1150-1280. 1154. Accession of Henry II., first Plantagenet monarch. Thomas a Becket (1117-1170), Archdeacon of Canterbury; son of Gilbert a Becket, a rich merchant and Portreeve (Mayor) of London; appointed Chancellor. 1155. Frederick I. (Barbarossa) of Germany creates the Kingdom of Bohemia. 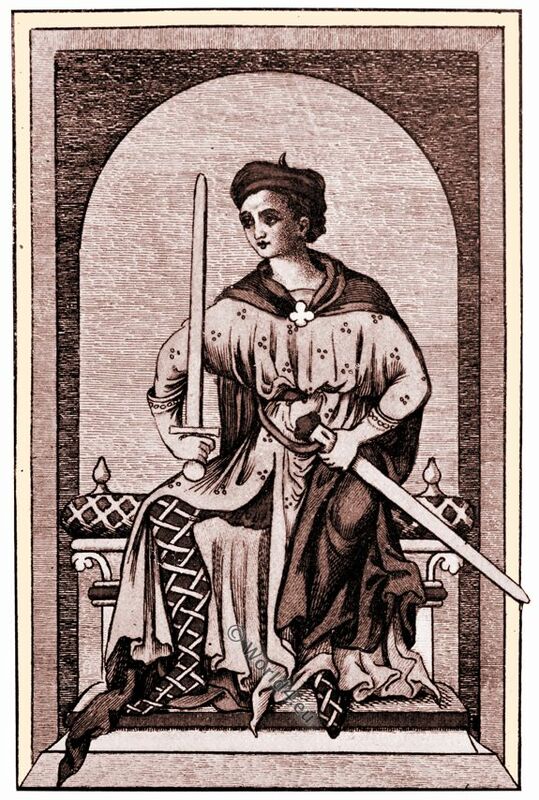 The Niebelungenlied (the national epic of Germany) and other poems composed about this time. 1161. Canonisation of Edward the Confessor. He was the penultimate Anglo-Saxon King of England. He is venerated as a saint. 1162. Canonisation of Charlemagne. Thomas a Becket made Archbishop of Canterbury; he immediately “put off the Deacon” and became the champion of the Church. 1163. 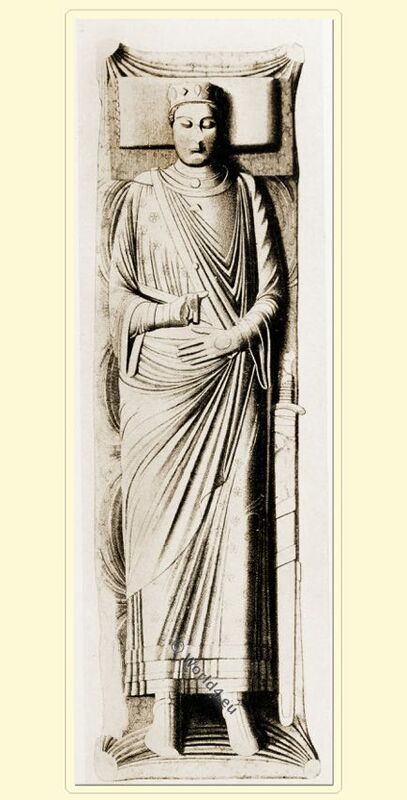 Gervase (Latin: Gervasus Cantuariensis) monk of Canterbury; chronicler; died c. 1210. 1165. William le Breton, continued the writings of Rigord; died 1220. 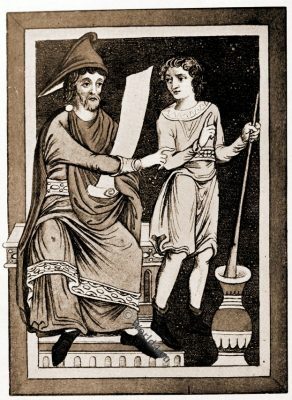 Rigord or Rigordus (c. 1150; – c.1209) was a French chronicler. Œuvres de Rigord et de Guillaume le Breton. order of Henry VIII., and the bones of S. Thomas were publicly burnt in 1538. S. Dominic, founder of the mendicant Order of Dominicans, born this year. Lambert le Tort, author of Roman d’Alexandre, circa 1170, in which “Alexandrines” were first employed. 1171. Conquest of Ireland (1169-1171) by Henry II.’s general, Richard Strongbow, Earl of Pembroke. 1173. Canonisation of S. Thomas a Becket. Great rebellion headed by Henry II.’s sons, assisted by the Kings of Scotland and France, but subdued by Henry the following year. Jocelyn de Brakelond, chronicler of S. Eadmund’s Abbey; died 1203. Brunswick-Luneberg (Hanover) ancestor of the Hanoverian kings of England. 1177. Benedict, Abbat of Peterborough; English historian; wrote lives of Becket, Henry II. 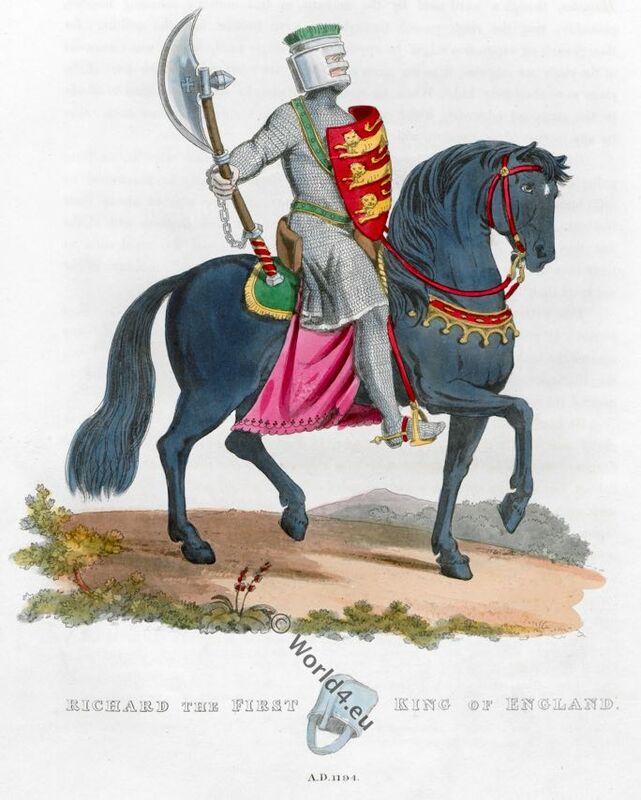 and Richard I. Keeper of the Great Seal from 1191 to 1193, in which latter year he died. 1180. 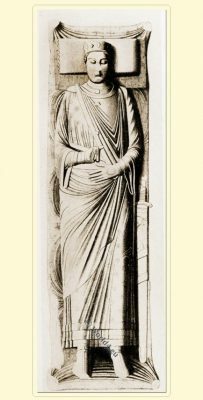 Matthew Paris, monk of St. Albans; scholar, poet, divine, traveller, politician, courtier, artist, and the greatest and last of the monastic historians. Died 1259. The Second Crusade ended with the fall of Jerusalem. 1182. “Il Francesco” (so named from his command of the Provencal tongue) born; son of a rich merchant of Assisi; founder of the Franciscan Order. Canonised as S. Francis. The most beautiful character in the history of Mediaeval Christianity. Died 1226. 1189. The Third Crusade undertaken by Frederick Barbarossa, Philipp II of France and Richard Lionheart of England. The Third Crusade was a warfare to which the Pope summoned the Kingdoms of the West in a bull after Sultan Saladin had conquered the cruiser of the Kingdom of Jerusalem and conquered the city of Jerusalem. Wholesale massacre of Jews in England. 1192. 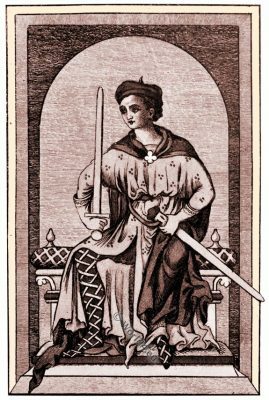 King Richard I. On his return he was shipwrecked at Aquileia, and became a wanderer. Eventually he was captured in a cottage in the suburbs of Vienna, and confined in the Castle of Durrenstein on the Danube, by Leopold, Duke of Austria. 1194. King Richard ransomed, and returned to England. He was recrowned at Winchester to wipe out the stain of his captivity, and left England for the last time 15 July of the same year. 1199. Death of Richard I. Accession of John. 1200. The Fourth Crusade, in which the Marquis Boniface of Montferrat and Baldwin, Count of Flanders, took an active part. Philippe II., Auguste King of France from the Capetian dynasty excommunicated, and all France placed under an interdict by Pope Innocent III. The University of Paris founded about this time. 1204. Duchy of Normandy and all other possessions in France lost to England by John “Lackland.” Seventh siege, and sack of Constantinople by the Latins. 1206. Election of Stephen Langton as Archbishop of Canterbury. King John refused him recognition, and quarrelled with the Church. 1208. Pope Innocent III. (1 198-12 16) placed England under an interdict. William the Clerk, Anglo – Norman poet, flourished; died 1226. 1210. Thibault, Count of Champagne, afterwards King of Navarre. Sometimes called “the Father of French Poetry.” Died 1253. The University of Oxford came into existence early in the thirteenth century. 1214. Roger Bacon, friar, scientist. Studied at Oxford and Paris. Died 1292.
of “Magna Charta,” a “Treaty of Peace,” at Runnymede, 15 June. John appealed to Pope Innocent III., who warmly took his part, ordered Stephen Langton to Rome, freed John from his oaths, and threatened to excommunicate the barons if they persisted in rebellion. 1216. War arose between the king and his subjects, who were on the point of offering the crown of England to the son of Philippe Auguste, King of France, when John died at Newark Castle in October 1216. The sources of information for the costumes of the reigns of Henry II., Richard I., and John are somewhat enlarged when compared with the preceding period, inasmuch as we have more manuscripts, and those executed in a better style, and certain effigies of royalty. The latter are of extreme value in showing regal costume, which, somewhat modified in richness of ornament, and divested of attributes pertaining to royalty, also furnish us with the dress of the nobility. The coronation robes of these three monarchs, we glean from manuscripts, consisted essentially of a long tunic called a Dalmatica, with loose sleeves, covering an under garment with tight sleeves and being about equal in length. Over the dalmatica appeared the mantle. This dress, coupled with boots, gloves, and headgear, which will be subsequently described, furnishes us with the attire of the nobility. Fig. 61.— Effigy of King Henry II., Abbey of Fontevrault, Normandy. 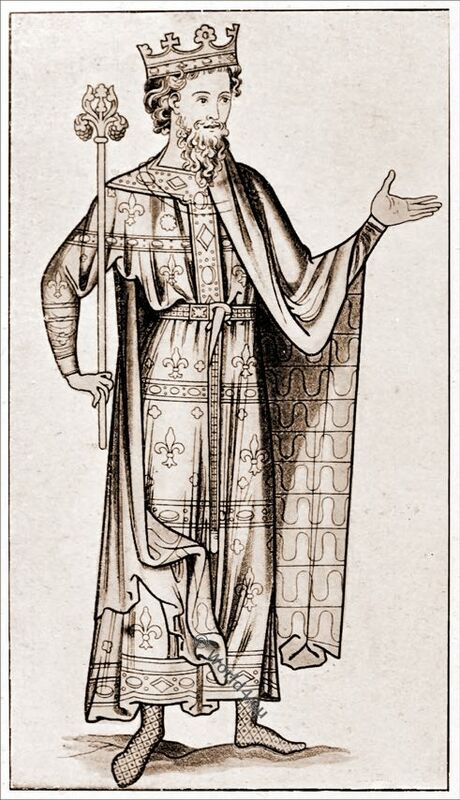 The earliest effigy of a King of England is that of Henry II., in the Abbey of Fontevrault in Normandy (Fig. 61, PI. ), a district which he much frequented with his Queen. It represents the monarch precisely as he appeared when lying in state. The dalmatica reaches to the ankles, and has the usual wide sleeves; it is crimson in colour, powdered with gold flowers. A small portion only of the under tunic is visible at the wrists, showing tight sleeves. The monuments of Richard I. at Fontevrault, and King John at Worcester, are very similar to those of Henry II. ; the dalmatica of the latter is, however, much shorter, and exposes a portion of the under tunic. An illustration of a contemporary king, which occurs in Roy. MS. 2 A xxii., circa 1190, is here reproduced (Fig. 62, PL). The dalmatica is ornamented with a rich design in which fleurs-de-lys predominate; a heavily jewelled collar, with pendant and a jewelled belt, are worn over it. The sleeves in this example are tight upon the forearm, and voluminous in the upper part. This peculiar shape of sleeve was prevalent in this, and probably at an earlier period. It will readily be noticed that a marked peculiarity of this garment consists in its having one seam only on either side, which runs from the under part of the wrist down to the hem. The mantle is white, richly lined with fur—the heraldic vair. The high boots have an ornamental pattern which is very common in manuscripts—a design upon a royal boot a century later is precisely the same. A nobleman of the thirteenth century in Bod. Auct. D iv. 17 (Fig. 63, PL) affords us a splendid example of the costume. The dalmatica is clearlyshown with a full sleeve previously described, and is open up the front. The colour of the original is red, and it is powdered with groups of three spots: the lining is white. The mantle of blue is fastened on the chest with a quadrilobed morse. The green gloves are a very distinctive feature; they have separate fingers, and reach half-way up the forearm, where they are elaborately embroidered. Upon the lower limbs red chausses are worn, covered with cross-gartering of gold, which, as will be seen, extends from the feet upwards. A garment, the Braccce, similar to the knickers of the present day, is also shown. The blue hat appears to be of cloth, and is a departure from the Phrygian. 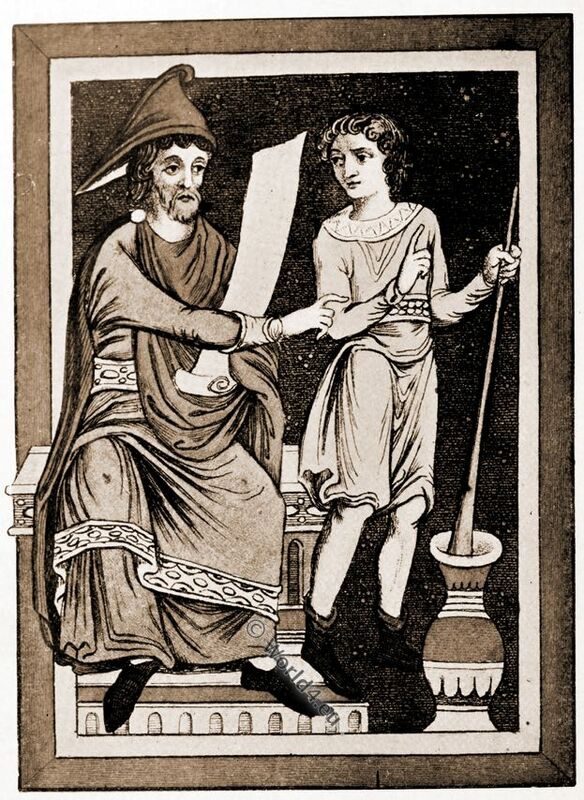 In Sloane MS. 1975 a doctor and his servant are shown (Fig. 64, PL); he wears a huge brown Phrygian cap, a red mantle fastening on the shoulder, a green dalmatica with an embroidered girdle and hem, from beneath which a brown tunic appears. 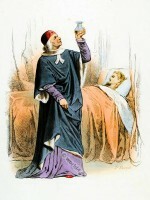 The servant is clad in a single tunic, and wears green chausses. The boots in both cases are black. Harl. MS. 4751 furnishes us with examples of hunting costume, in which the bracca? are very distinctly shown and no cloaks are worn (Fig. 65, PL). Upon the heads in two cases appear Coifs, almost universally used by hunters at this period. This is a very ancient head-dress, being worn at times by both men and women; subsequently it appears to have become a distinguishing attribute of the habit of the legal profession, and even at the present day has not fallen entirely into disuse. It is interesting to know that the bronze head of a Greek warrior has been found decked in a coif. During the twelfth and thirteenth centuries it appears to have been common to nearly every class of society. Thus, in Harl. MS. 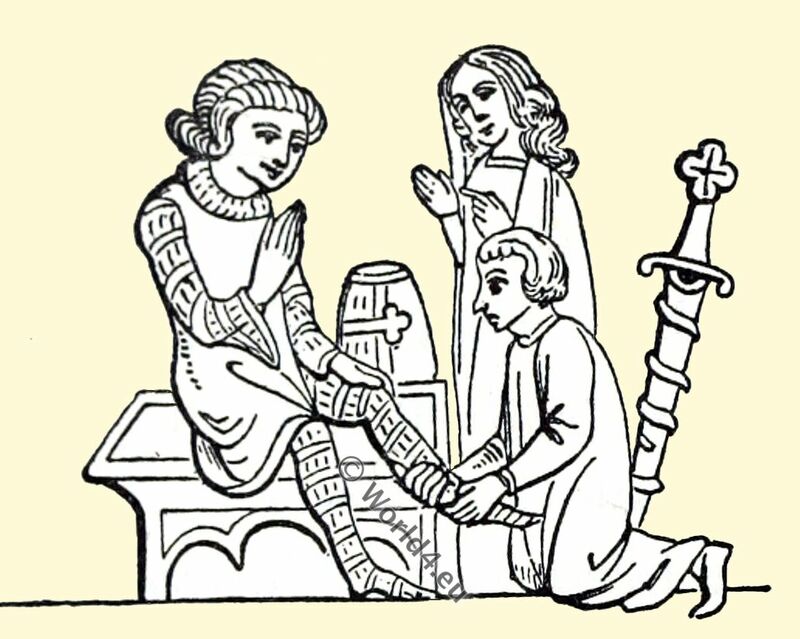 Roll Y vi., twelfth century, the “Life of St. Guthlac,” bricklayers and masons are represented with it; a sailor wears it in a late twelfth century Harl. MS. 4751; it is seen upon the heads of the soldiery and a number of spectators of different degrees in the “Vie de St. Thomas,” written circa 1230, &c.
Super-Totus.—This furnished the overcoat of the period as a protection against cold and wet. It was much used by travellers and equestrians. The shape of the garment varied very much with individual taste, but the general pattern adopted was one based upon the ecclesiastical chasuble. 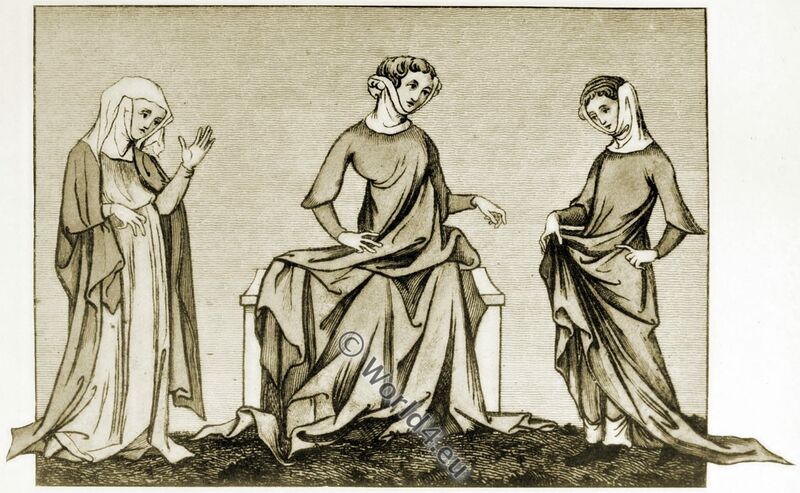 A circular piece of cloth had a hole made in the centre through which the head was passed; in most cases a hood was attached, and the wearing of this probably gave rise to the capuchon, which came into use during the next period. (Fig. 66, PL) Eleanor of Aquitaine 1124–1204. From the enamelled stone effigy on her tomb in the Abbey of Fontevraud, in France. 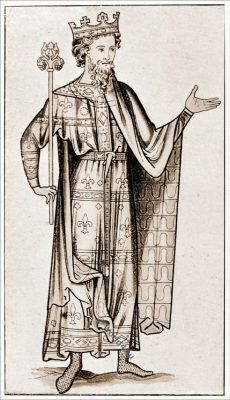 Queen Eleanor, consort of Henry II., is buried at Fontevrault, Normandy, and her effigy shows the regal dress at the end of the twelfth century (Fig. 66, PL). The under tunic of white appears only at the throat, where it is fastened by a circular brooch; a voluminous robe with sleeves tight at the wrists and enlarging towards the upper arm is worn over it, and is confined at the waist with a narrow girdle. This robe is white, and a pattern is worked upon it consisting of golden crescents in pairs, contained within the meshes of an interlaced network, also of gold over the robe a blue mantle is shown, which, secured by a cord across the chest, a fashion which subsequently prevailed for centuries, hangs down the back, but is brought forward over the lower part of the figure and held by the right hand. It is studded with golden crescents. The head is attired in a Wimple and Peplum. This form of head-dress prevailed from the time of Henry II. to Edward I. The wimple in its earliest form was a piece of white material, which was passed under the chin, and the two ends brought upwards towards the top of the head, where they were fastened together by a pin or brooch. The peplum was only the couvre-chef masquerading under another name; it was placed as usual upon the top of the head, and fell down symmetrically on either side of the face, and over the back of the head. Originally of pure white material and without ornamentation, they subsequently became decorated, and of various colours, the wimple at times being of a different hue from the peplum. As saffron is often mentioned by old writers in connection with the wimple and peplum, we must infer that yellow was the prevailing colour. Fig. 78.— Ladies’ dress, temp. Edward II. The term “wimple” includes the peplum, and will be used in this sense in the following chapters. Long after it had been discarded as a head-dress by the upper classes, it remained in use by the middle and lower orders. The same disinclination on the part of the ladies to show the hair was still manifested during this period, and practically in no illuminations is it apparent. A curious exception to this unwritten law is that of the Queens. On effigies of this and subsequent reigns, we find the hair fully exposed, sometimes in its natural condition and hanging down the back. This was a special privilege of queenly rank; upon their marriage the hair was worn flowing, and the same fashion was represented upon their effigies; it is also natural to assume that queens were above suspicion. The practice, however, has led to much misconception, and persons not representing royalty have appeared on the stage and elsewhere, in costume of the period with flowing hair, citing the queenly effigies as authorities. There is no doubt that an elaborate coiffure was invariably worn under the wimple, for we can distinctly discern the protuberance caused by it (Fig. 78, Pl. ), but only under exceptional circumstances was it ever seen. A rare example of the hair exposed in the privacy of home is seen in Fig. 67. The dress of a lady of rank at this time may be gathered from Fig. 68, PL, which represents the Virgin and Child, and is taken from Roy. MS. 14 C vii., 13th century. So far as the head is concerned, she is represented as a queen, with flowing hair and a crown. Fig. 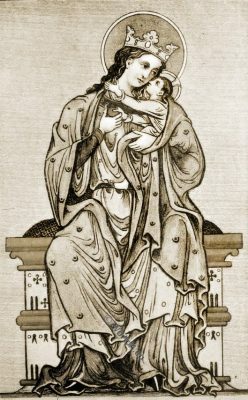 68.— Virgin and Child, showing lady of rank, thirteenth century. This garment varies in no respect from the preceding robes, except with regard to the sleeve, which is now tight to the wrist. It lies in copious folds upon the ground, and was evidently very voluminous. At times this robe was termed the Capa. The Cyclas played the same part in the lady’s dress that the dalmatica did in that of the man. It was not, however, of the same form, being generally devoid of sleeves; so far as length and appearance round the neck is concerned, it is remarkably similar. The figure shows it confined at the waist by a belt, while the ornamentation consists of small circles upon the yellow ground. The Mantle in this case is shown very large, and, contrary to the usual custom, is not lined; it is green in colour, ornamented with small circles with spots in the centre. Three young girls are delineated in Fig. 69, PL (Sloane MS. 3983), which exemplify the prevailing dress. The first wears a robe only, which spreads upon the ground; the sleeve is shown very clearly to be of large dimensions in the upper part, and was probably cut in the same method as that described in Fig. 62, PI. ; this, however, is not the case with regard to the robe upon the second figure, from which we must infer that the fashion was not universal. A peculiar feature is illustrated in these two figures, in looping up the robe in festoons to prevent it trailing upon the ground. The middle figure, in doing so, has exposed the hem of the under tunic, which appears to be fringed. She wears over the robe a cyclas with no decoration; the shape, however, is very clearly seen, and leads us to conjecture that we have here the inception of the subsequent Super cote-hardi of a century later. In the case of the third figure the cyclas is so voluminous that a part of it trails upon the ground. The Bliaut was a garment worn during inclement weather; it appears to have been of no particular shape or dimensions, and was common to both sexes. From descriptions of it, we infer that it must have been sometimes of expensive materials, but at the same time, as it is stated to have been occasionally made of canvas or fustian, we conclude that it was common among the middle and lower classes. Some writers trace the descent of the blouse of the French workman and the smock-frock of the English agricultural labourer from the bliaut. Source: British costume during XIX venturies (Civil and Ecclesiastical) by Mrs. Charles H. Ashdown. Lecturer upon costume and mediaeval head-dresses. Expert adviser upon costume to several of the great pageants, ect. Published by Thomas Nelson and Sons LTD, London. 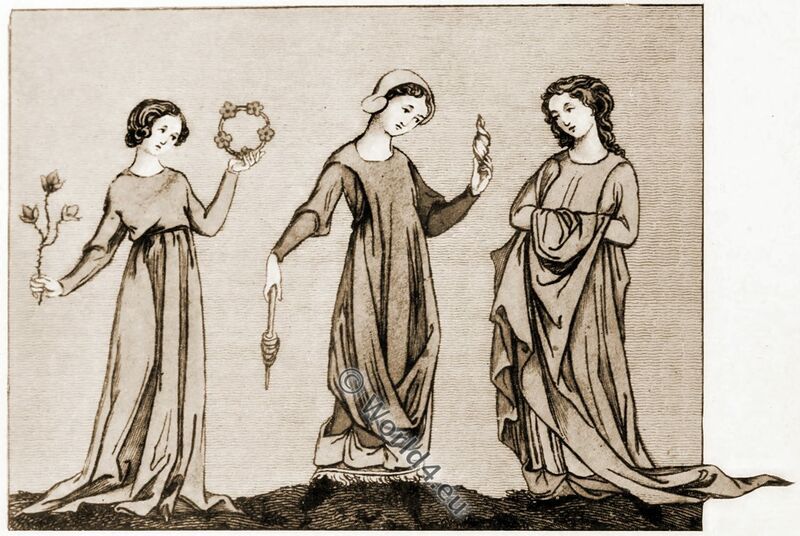 The year 1200 is not a striking division in the history of costume or art, for the first years of the thirteenth century must be considered as a continuation of the last years of the twelfth. The armour of the reign of King John was nearly the same as that of the reign of Richard I. In the course of the thirteenth century the quilted armour, then prevalent, began to be superseded by chain mail, which also had been borrowed from the Saracens. A new weapon came also into use, called the martel-de-fer, a pointed hammer, used for breaking the links of the armour. The helmet took the form of a barrel, and towards the end of the century it was surmounted by a heraldic crest. In the time of Edward I the aillettes, for the shoulders, are said to have been introduced; although in one of our illustrations in the present volume, of a much earlier period, a cross appears in the situation occupied by the aillette. 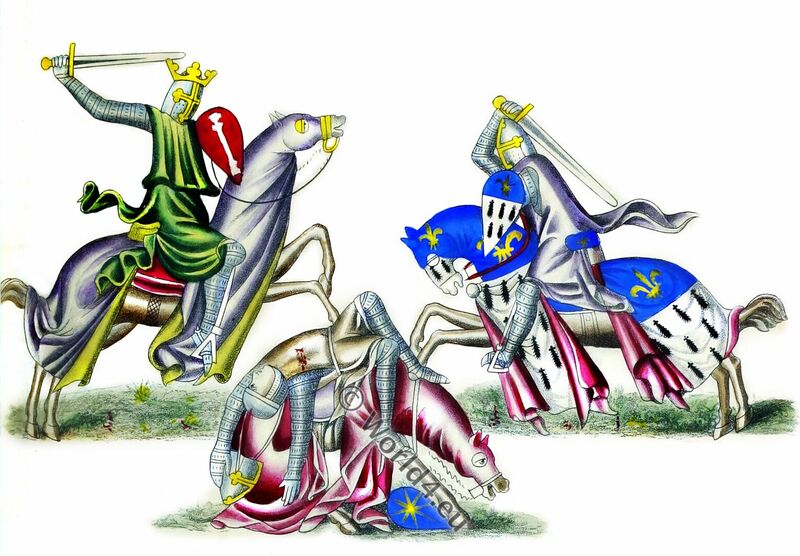 Our plate of Knights Fighting is taken from a foreign MS., which may account for some apparent anomalies, particularly the kite-shaped shields, which were not used in England at this period. Several new and rich stuffs were introduced early in the thirteenth century, brought generally from the east. The siclaton, which preserved its Arabic name, is supposed to have been a sort of fine silky woollen; the baudequin, a rich silk woven with gold, is said to have taken its name from Baldak, or Bagdad. 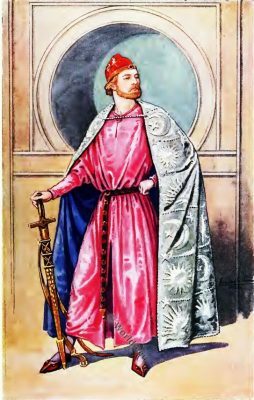 Siclaton, or Siglaton, was chiefly employed in a super-tunic, or outward gown, which was known by the name of the stuff, and is frequently mentioned in the earlier poets : it was worn indiscriminately by persons of both sexes. Besides these, there were a great variety of costly furs, silks, &c. and we now find mention of velvet. 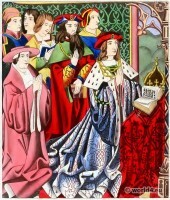 Among the stuffs mentioned in the reign of Edward I. are sendel (which appears to have come from India or Persia), sarcenet (which is said to have derived its name from the Saracens), tiretain, or tartan, a woollen cloth of a scarlet colour (its name derived by some writers from Tyre), gauze (said to have been manufactured at Gaza in Palestine), and burnet. “The queen had clothes of silk, They were brought from Baldak; They were furred with white ermine. The mantle, the bliault, all train after her. Her locks on her shoulders are Banded in line on fine gold. She had a circle of gold on her head. The male attire appears not to have undergone so many changes during this century as the costume of the ladies, although it was composed of equally rich materials. Under Henry III. the men in general wore breeches and hose, and over them a long tunic, open in front, sometimes as high as the waist. Over these they wore the siclaton. Writers of the time speak of a fanciful, apparently jagged, mantle, named a cointise, which was used perhaps in place of the siclaton. The shoes were long-toed, and among the rich they were very richly embroidered in fret-work. On the head people sometimes wore cowls, at other times round caps and hats, and, when on horseback, a coif attached under the chin. Under Edward I, we find no change in the general character of the dress: but the fret-work is transferred to the hose, which are richly ornamented. The chief alteration in the dress of the lower orders (which had remained nearly the same since the time of the Conquest), was the addition of a coarse outer garment resembling the modern smock-frock. The only remarkable change in the ecclesiastical costume was the introduction of the different dresses of the many newly established orders of monks. In artistical skill, the earlier years of the thirteenth century partake of the character of the twelfth. The illuminations of the middle and latter part of the century are less correct in outline, and deficient in spirit, but more elaborately and richly coloured. Ornamental design was becoming gradually so varied and fantastic, that it is not easy to describe its characteristics in limited phraseology. British costume by Mrs. Charles H. Ashdown. English costume by Diane Clayton Calthrop. 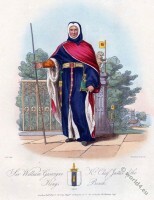 English costume and fashion by Lewis Wingfield. Samuel Rush Meyrick. ‘A Critical Inquiry into Ancient Armour, as it existed in Europe, but particularly in England, from the Norman Conquest to the Reign of King Charles II’. London: John Dowding, circa 1830. Dresses and Decorations of the Middle Ages Vol 1., by Henry Shaw F.S.A. London William Pickering 1843. 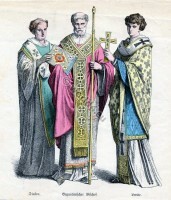 Byzantium Bishop, Deacon and Levite costumes. Middle ages military. 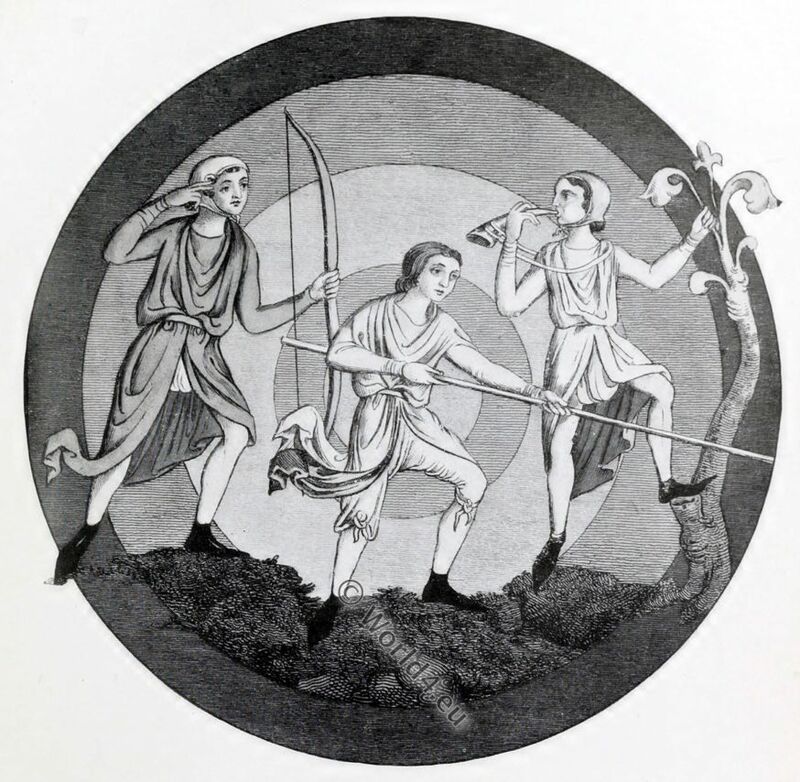 Archer and Crossbowman 1350 to 1380s. Sir William Gascoigne, Chief Justice of the Kings Bench. Ancient British costume history. The Britons. Anglo-Saxon fashion history. England c. 460 to 1066. Eleanor of Aquitaine. 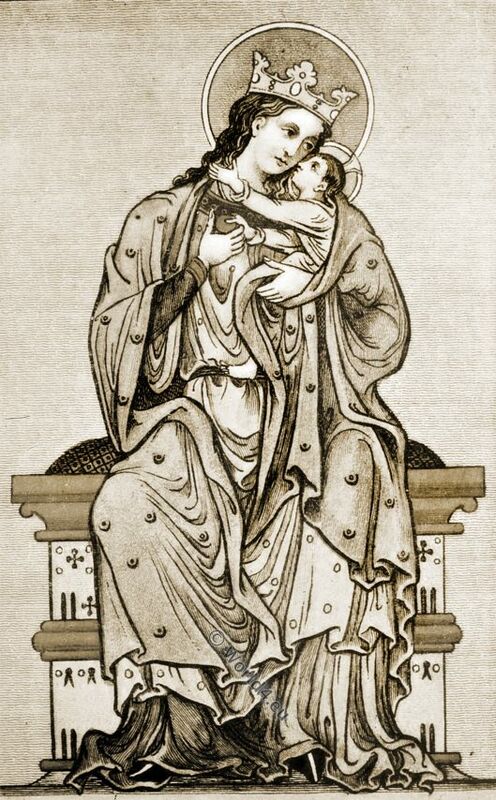 Medieval Queen 12th century.